St Chad’s Church at Rochdale, Greater Manchester. OS grid reference: SD 8964 1313. St Chad’s parish church stands upon a lofty ridge overlooking the River Roch and the town of Rochdale, Greater Manchester. The church is a very imposing edifice standing high above the equally imposing Victorian town-hall and its famous clock tower. There was a church here in either the late Saxon period, or more likely just after the Norman conquest – the mid 11th to early 12th centuries – although that is open to question. There is a well-known legend that says there were problems with the siting of the first church which was being built on lower ground on the other side of the river, and that it had to be re-sited to the higher position that we see it today. The church can be reached from opposite the Town Hall carpark and by climbing the steep 124 steps up to Sparrow Hill. 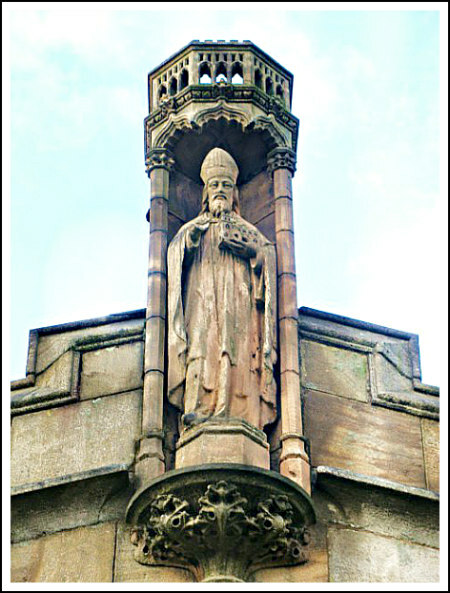 St Chad’s statue, Rochdale Parish church. St Chad to whom Rochdale parish church is dedicated was a 7th century northern churchman who became abbot of Lastingham in Yorkshire, and for a while he was bishop of York until St Wilfrid returned from France. Later, he was made bishop of the Mercians at Lichfield. He died in 672 AD and his feast-day is held on 2nd March (Colin Waters ‘A Dictionary Of Saints Days, Fasts, Feasts And Festivals’). The town of Chadderton near Rochdale is probably named after St Chad. There are no antiquities of great age within St Chad’s, although the Tudor pews are of some notable interest and parts of the church tower are ‘thought’ to date back to the late Saxon age, or more likely the early Norman period. The statue of St Chad high up on the outer south wall is particularly fine. The Lancashire poet John Collier (Tim Bobbin) 1708-86 is buried in the churchyard. Ball, Dennis, Lancashire Pastimes, Burnedge Press Limited, Royton, Greater Manchester, 1987. Bord, Janet & Colin, The Secret Country, Granada Publishing Limited, St Albans, Herts, 1980. The Automobile Association, The Illustrated Road Book Of England & Wales, London WC2, 1961. Waters, Colin, A Dictionary Of Saints Days, Fasts, Feasts And Festivals, Countryside Books, Newbury, Berks, 2003. 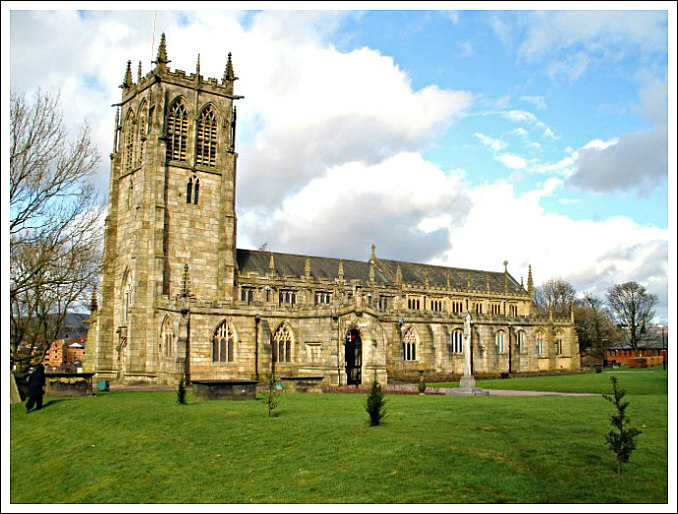 Categories: Ancient Churches & Chapels, Myths And Legends | Tags: St Chad's Church at Rochdale in Greater Manchester | Permalink.